Looking around PVMA today, a young child is crying in frustration because they are unable to zip up their puffy winter jacket. Feeble attempts at expressing a need for help pour out into trickling little tears. An older child notices this outburst and rushes over to the younger one. “I know how to zip! I can help you!” This kind of simple, yet considerate act is seen every day in many forms inside of this community-based Montessori school. The two women who created this beautiful and compassionate community were inspired by their philanthropic roots. Growing up, Katie and Summer were both raised in families that strongly emphasized and encouraged service for others, and actively contributed to their communities. Katie remembers as young as four years old volunteering with her family at local shelters, preparing meals and sorting clothes. Despite being a child, she was always given tasks that were manageable but also important. This responsibility instilled a confidence and respect within her which helped shape her belief in children’s ability to make a meaningful impact on society. Summer was also very active in her community – whether it be volunteering at the recycling center or being a member of 4-H, her family stressed the importance of being a contributor and member of the community in some form. Her ideals of children making a difference really began to solidify during her high school years, while teaching Character Counts to elementary-age students. In doing so, she realized that children need to learn about responsibility, kindness and citizenship, among other values-but that they can be taught in a fun way, and can be understood and developed at an early age. Both women experienced moments of disillusionment while searching for their life passions. Katie experienced this during her student teaching years. Frustrated with a system emphasizing standardized tests, she wondered “why aren’t we teaching these children the importance in why what they’re learning is important?” As fate would have it, shortly after having these frustrations she discovered the Montessori Method and instantly fell in love with the philosophy. Not only are children explained the “why”, but they physically perform tasks to reinforce what they are learning. She immediately took the training and began her career as an educator of the Montessori philosophy. Though Summer had always worked with children in various jobs, her path of teaching was not always so clear. After moving to Minnesota from South Dakota, she worked at an upscale baby clothing store while also attending night school to become a social worker. She struggled being caught in a dichotomy of these two contradictory worlds, and so began casually looking for other job openings. She was drawn to one particular phone book ad for a Montessori school looking for an assistant; she began as soon as she landed the position. One day, while observing and writing notes as instructed, a little girl stood out to her. Her blonde ponytail was glimmering as the sun beamed in from the window. She had a bean bag on her head and was skipping on a line. Overcome with emotion, Summer began bawling; this moment affected her so deeply. She saw how happy and capable the children were. She realized that this, whatever this was, was what she was meant to do with her life. She started the Montessori training right away and also launched her career as a Montessori educator. Through their various working experiences in different Montessori schools, Katie and Summer’s paths continued to cross. A deep friendship evolved, and they grew closer while discovering similar goals, dreams, and passions. They eventually co-taught at the same school, during which they attended a conference. The focus of it explained all-day, year-round Montessori, as opposed to the traditional 9-month, 8:30am to 3:30pm program. The traditional program has a lot of transitions and requires the children to change classrooms several times a day. At this time, all-day/year-round preschool was unheard of in the Twin Cities and much of North America. Inspired, Katie and Summer excitedly brought this new concept to their administrator. His response was along the effect of “I’m glad you’re inspired, but that’s not the direction we’re headed.” They found themselves at a standstill. Should they stay somewhere knowing and wanting something better, go somewhere and try to convince that program to change, or start their own school to implement this new approach? They were still debating their options when they discovered a little building in Golden Valley up for lease one day, and there it all manifested. They envisioned students at little desks doing their work, the sun pouring through the big front-facing windows. It felt like a home away from home. It was obvious to them that this was where they were supposed to be; they had found their school. The lease was signed the next day-Summer hadn’t even told her husband about it. At the time Katie was 25 years old, and Summer was 27 years old. Today, the core values that PVMA has been founded on are leadership, citizenship, and partnership. The women want to develop strong and confident leaders, though they emphasize that leadership does not necessarily mean being the decision maker of everyone. It can be quiet acts of compassion, not always being acknowledged but doing the right thing. They want their children to be active members of the world. This includes being active citizens of the PVMA community, in the larger area of Golden Valley, MN, and of the world. Finally, they want PVMA to be an extension of the home. This includes having a comforting environment to the adults in the space. They want the parents and families to be partners with the school; to meet and discuss difficult topics, and to triumph successes together. PVMA strives to partner with families in the greater community as well. 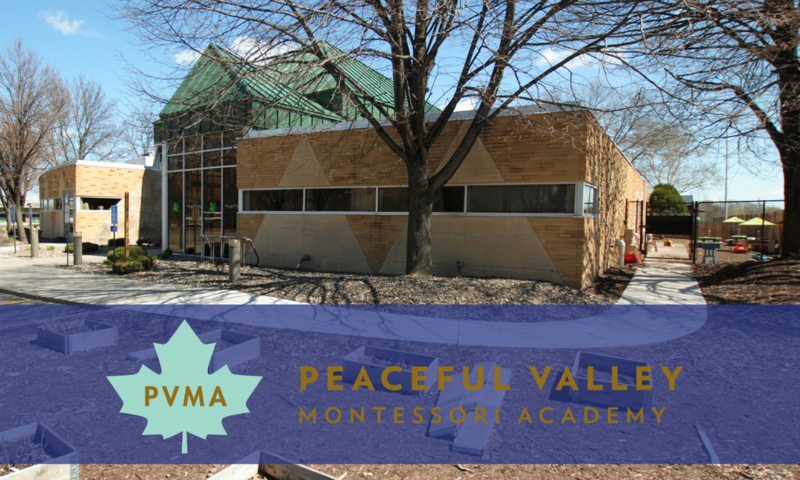 Peaceful Valley Montessori Academy aspires to send every single person –student, parent, or staff member- out into the world better than when they came in. They hope that by instilling and fulfilling the three founding values in each individual, they are able to achieve that goal.